Habit: Annual, perennial herb, loosely to densely cespitose, generally +- glabrous, rhizomes present or 0; bisexual, dioecious in Festuca kingii. Stem: decumbent, ascending to erect, to 2 m. Leaf: basal and cauline; sheath generally persisting; collar generally glabrous; ligule generally < 1 mm, membranous, truncate, minutely fringed; blade flat or rolled, claw-like basal auricles generally 0. Inflorescence: panicle-like, branches dense and appressed to open and spreading or spike-like. Spikelet: glumes 2, < lowest floret, unequal, lower sometimes minute, 1--3-veined, upper 3--5-veined; axis breaking above glumes and between florets, florets (1)2--10(17), generally bisexual; lemma 3--5(7)-veined, base generally glabrous, tip entire, occasionally minutely 2-toothed, awn 0 or terminal, generally straight, glabrous; palea +- = lemma; stamens 3 or 1. Fruit: obovoid to elongate, free from or +- adhering to palea and lemma. Species In Genus: 500+ species: cosmopolitan. Etymology: (Latin: straw, stem or straw-like weed) Note: As treated here, including ×Festulpia, ×Festulolium, Leucopoa, Lolium, ×Schedolium, ×Schedololium, Schedonorus, and Vulpia. Lolium rigidum Gaudin (combination in Festuca evidently not available), native to Europe and Africa, has been found sporadically as an urban and agricultural weed, but has not been collected in recent years and is doubtfully naturalized. Habit: Perennial herb. Stem: 3--13 dm, loosely clumped; nodes visible. Leaf: sheath shredding with age; ligule < 0.5 mm; blade 10--30 cm, 2--7 mm wide, flat or loosely rolled, basal auricles +- clasping stem, glabrous. Inflorescence: 10--25 cm, narrow, branched only at lowest node. Spikelet: 12--15.5 mm; lower glume 2.5--4 mm, upper 3.5--5 mm; florets 4--10; lemma 6--8 mm, awn << 0.5 mm or 0; anthers 2--4.5 mm; ovary tip glabrous. Chromosomes: 2n=14. Ecology: Disturbed places; Elevation: generally < 2000 m. Bioregional Distribution: CA-FP (less common SW), GB; Distribution Outside California: to eastern North America; native to Eurasia. Flowering Time: May--Jul Note: Grown for forage. 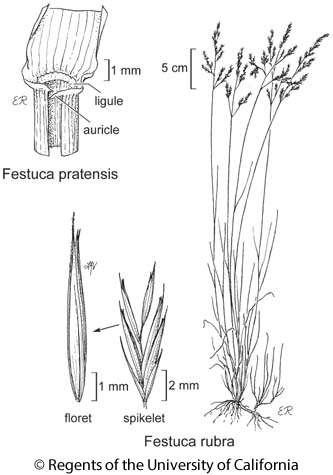 Citation for this treatment: James P. Smith, Jr. & Susan G. Aiken 2012, Festuca pratensis, in Jepson Flora Project (eds.) Jepson eFlora, http://ucjeps.berkeley.edu/eflora/eflora_display.php?tid=25822, accessed on April 20, 2019. CA-FP (less common SW), GB; Markers link to CCH specimen records. Yellow markers indicate records that may provide evidence for eFlora range revision or may have georeferencing or identification issues. Purple markers indicate specimens collected from a garden, greenhouse, or other non-wild location.